Oakland-based art and tech studio 💾🌵 takes critical look at A.I. Artificial intelligence is not as advanced as you may think. Sure, it’s technologically advanced, but it lacks a general understanding of what’s socially acceptable to say, the real world and the way humans interact. In the last couple of months, Microsoft has had a couple of failed attempts with artificial intelligence. The first involved an image recognition app called Fetch!, which looks at photos of dogs to identify its breed. People, of course, started to use the app to determine what breed of dog people resemble. In doing so, people began to notice that the app identified Asian people either as Pekingese or Chinese Crested dogs. Earlier this week, Microsoft launched an A.I.-powered bot named Tay to interact with people on the Internet. Within a day, people had pretty much hijacked the bot to tweet racist commentary and other inappropriate content. After just 16 hours worth of chats, Microsoft silenced Tay. Oh, and let’s not forget about the time when Google screwed up royally by tagging photos of black people as gorillas. Yeah, that was really bad. 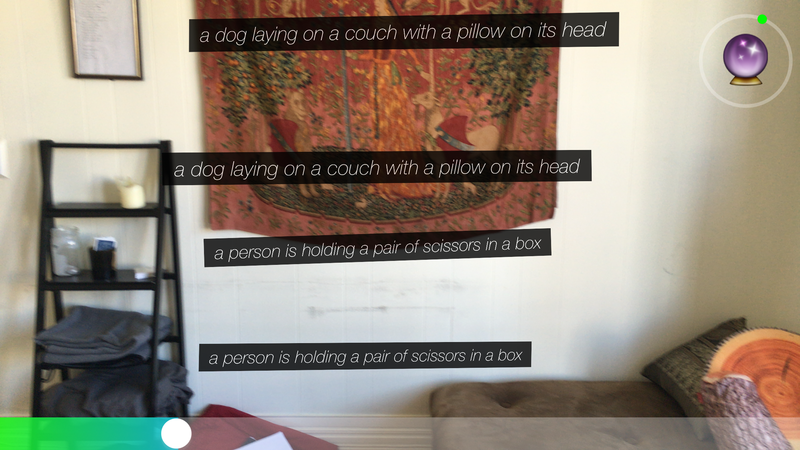 💾🌵(“disk cactus”) recently launched an iOS app called AI Scry that is designed to identify objects in the world. It relies on a Microsoft data set called MS COCO, which uses neural networks to recognize images. Neural networks are one type of model for machine learning. So, when it comes to images, you can think of it as a pattern recognition system. The AI Scry app is intentionally fun and light-hearted, 💾🌵co-creator Sam Kronick (pictured above through the lens of AI Scry) told me. Kronick and 💾🌵’s other co-creator Tara Shi (also pictured above) were looking for a creative, non-intimidating way to talk about the issues of A.I. Ultimately, the goal with AI Scry is to pick apart A.I. and “point out that it’s not magic,” Shi said. While working with the Microsoft data set, Kronick and Shi said they really started to understand the biases built into the system — the objects that it’s really good at seeing and the objects it refuses to see. “Conceptually, this is interesting because you have this whole class of algorithms that are designed to do things that feel really, like, almost from another century,” Kronick said. But, at the same time, he said, it’s as if all of the advances we’ve made in social sciences and the way we talk about variants in the world amongst people or objects or things don’t exist. AI Scry identifies everyday, generic things like food, a car at a stoplight, a man holding a cake, and so on. What it doesn’t do well is tell you anything about the scenario. In a war zone, Kronick said, AI Scry would be wrong in a way that would be really uncomfortable. Upon first hearing about AI Scry, TechCrunch’s Matthew Panzarino wondered about potential accessibility uses. Kronick told me that he’d feel “a little concerned” using this technology to try to help blind people navigate a city or try to cross the street, in part because the tech software wasn’t written from the perspective of what someone who is blind might need. He went on to say that the technology, as it stands right now, prioritizes what a sighted person may find interesting about a particular scene. He went on to say that AI Scry is more of a critical project that’s trying to break apart what’s going on at the core of artificial intelligence, and there’s a lot more critical thinking to be done on the topic. In the near future, Shi is going to embark on a 3D generating rocks project that relies on neural networks to further explore the implications of artificial intelligence. With the 3D generating rocks project and AI Scry, the goal isn’t to make money. Although 💾🌵charges $0.99 for the app, that goes towards keeping the project running and paying for the costs of servers and whatnot. Some of their other projects include an emoji keyboard, which they recently started selling via Urban Outfitters, and a Wi-Fi walkman that reads off Wi-Fi network names as you walk through the city. When 💾🌵 isn’t tinkering around with projects like AI Scry and the Wi-Fi walkman, the studio is working with big corporate clients like Google. At the last Maker Faire, 💾🌵 created an experiment for Google as part of its Breaker lab at the fair, in which kids performed science experiments by breaking stuff. The kids stuffed a bunch of confetti of different colors in a balloon and inflated it until it popped. The 💾🌵 watched it with a high-speed camera outfitted with computer vision algorithms to track the particles and generated music out of the explosions. “The studio is a platform for us to build on all these ideas, whether they’re going to be profitable or not, rather than trying to have a startup model of building some wacky ideas and gambling on whether they’re going to end up being something big,” Kronick said.